Adductor tendinopathy describes a number of conditions that develop in and around the tendon in response to chronic overuse  At a histopathological level there are changes in the molecular structure of the tendon, typically collagen separation and collagen degeneration  and at a macroscopic level typically see tendon thickening, a loss of mechanical mechanical properties and pain . The role of inflammation is still debated as research has demonstrated that there is usually an absence of inflammatory cells around the lesion  hence the terminology 'tendonitis' is outdated. The adductors consists of 5 muscles, which can be divided into the long and short adductors: the long adductors (Gracilis and Adductor Magnus) attach at the pelvis extending to the knee and the short adductors (Pectineus, Adductor Brevis and Longus) also attach at the pelvis and extend to the thigh bone. These adductor muscles help to stabilise the pelvis and pull the legs towards the mid line (adduction). The adductor muscles extend from the lower pelvic bone, attaching to the lower femur area around the knee and sit in between the flexor and extensor muscles of the thigh. They are used when we cross our legs and help to balance the pelvis in standing and walking. Adductor Magnus is the largest muscle of the group, sitting posterior to the others. There are 2 parts to the muscle, the adductor part and the hamstring part. The adductor part extends from the inferior pubic ramus and the ischila ramus attaching to the linea aspera of the femur and the medial epicondyle (its tendonous insertion). The hamstring part extends from the ischial tuberosity to the adductor tubercle and the medial supracondyle line. Its actions are adduction, aiding in flexion of the thigh (adductor part) and in extension of the thigh (hamstring part). Adductor Longus extends from the superior pubic ramus and the pubic symphysis attaching at the linea aspera. It is a large and flat fan shaped muscle which forms part of the medial border of the femoral triangle. It also forms an aponeurosis at its distal attachment which extends to the vastus medialus muscle. It adducts and medially rotates the thigh. Adductor Brevis sits under longus and extends from the inferior pubic ramus to the posterior aspect of the linea aspera. Brevis adducts the thigh. Gracilis is the only 2 joint muscle, extending from its attachment at the inferior border of the pubic symphysis to the medial surface of the tibia, inserting into the pes anserinus between the tendons of sartorius and semitendinosus. 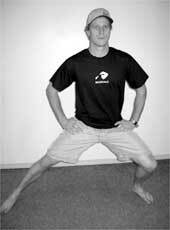 It is the most superficial of the group and acts to adduct the thigh and flex the leg at the knee. The adductors are active in many sports such as, running, football, horse riding, gymnastics and swimming. The repetitive nature of the movements in some of these sports and the constant change of direction in others heavily stresses the adductor tendon. which makes athletes more prevalent to adductor tendinopathy and also groin injuries. Other causes can be over stretching of the adductor tendons  or a sudden increase in training or the type of training, such as intensity. The development of adductor tendinopathy is multifactorial. One such factor is a significant leg length discrepancy which affects gait pattern. (although there is no clarification as to what what is significant). Poor or altered movement patterns during physical activity may also overly stress the adductor tendons. Muscular length differences, strength imbalances or muscular weakness in the lower limb or the abdominals can also be influential in developing adductor tendinopathy. Other factors can be; a lack of warming up, inactivity, fatigue, obesity, age-related weaknesses, degeneration or genetics. Exact pathology is however, unclear. Adductor tendinopathy is usually felt as groin pain on palpation of the adductor tendons, adduction of the legs and/or of the affected leg. Pain can develop gradually or appear an acute, sharp pain. A swelling or a lump may also be felt affected in the adductor muscle(s), stiffness in the groin area or an inability to contract or stretch the adductors. In severe cases physical activities will be restricted  as the tendon can no longer sustain repeated tensile loading. The causes of groin pain can be numerous due to musculotendinous, neurologic and internal structures in the area with Osteitis Pubis being difficult to distinguish from Adductor tendinopthy. Other diagnosis' can be; sports or inguinal hernia, iliopsoaas bursitis, stress fracture, avulsion fracture, nerve compression, snapping hip syndrome or chronic prostatitis. A physiotherapist can make an objective diagnosis following a thorough assessment or further investigations can be undertaken such as; Ultrasound, MRI or CT-scan. An outcome measure is the return to sport at the previous level without pain. The athlete has to develop muscular strength and stability around the groin and pelvic areas by engaging in specific exercises relevant to the demands of their activity/sport and with different levels of difficulty, such as training for speed and jumping. Another important aspect is muscular flexibility. Regular stretching is recommended. Products such as mobility and muscular supports may also help by alleviating high impacts. Pain relief is recommended in the first instance, although NSAIDS may be ineffective due to non inflammatory nature of the injury. Steroid injections are not always indicated due to the potential for tendon rupture if injected directly into the tendon. Physiotherapy is recommended for the treatment of adductor tendinopathy, where active therapy through an exercise programme is superior to a more passive treatment approach, although there is no gold standard for rehabilitation of the tendon. Recovery is highly variable across individuals as the condition may be degenerative or a failed healing from loading. Individuals may respond well to rehabilitation programmes or the in some cases the tendon may be unresponsive to a range of treatment. Strengthening abdominal core muscles is also recommended to support the adductors during activity as well as hip flexor exercises. Exercises should then be tailored to the athlete's specific sport to avoid recurrence. In acute cases, a return to a normal function can be within in a few weeks, but in more chronic cases, rehabilitation can take a number of months before returning to normal, pain free, activities. Treatment consists of rest from aggravating activities for an acute injury in the first 48 hours. Apply RICE treatment 3 times a day for 10-20 minutes to help reduce swelling and inflammation from any sudden trauma. When the swelling has decreased, blood flow stimulation therapy may be started to increase the healing process. Active treatment is then indicated to maximise rehabilitation. The aim of rehabilitation is to restore muscle and tendon properties, where strength training is beneficial to the tendon matrix structure, muscle properties and limb biomechanics  Recent evidence suggests that eccentric based exercise programme is the most effective as well as heavy-slow eccentric and concentric exercises for improving both pain and function in the tendon, but Cook et al have proposed that a new, 3 stage model of tendinopathy where exercise treatment differs between stages. They suggest that the current treatment protocol of eccentric loading, used for stages 2 and 3, could be detrimental for a stage 1 tendinopathy. For effective treatment identifying the stage of the tendinopathy is crucial. Load provides a positive stimulus to both the tendon and muscle tissues, yet no single effective method exists for tendon rehabilitation, with variations in repetitions, sets and the load applied depending on the stage of rehabilitation and the patient's muscle-tendon response to the exercises. Exercises aim to address the neuromuscular and tendon changes (strength and capacity) in tendinopathy. .
Stretching is also not indicated in the reactive stage as it can produce a compressive force on the affected tendon, aggravating the symptoms. An option is massage to maintain muscle length. In this acute stage the advised treatment is isometric exercise over eccentric (resisting load, but without movement) along with rest from the aggravating activity, where rest is relative for the individual. i.e. rest from the aggravating activities which may be speed, distance, intensity and to be wary of any pain that may appear 24 hours later. Symptoms and pain response will have to be the guide and cross training is advised to maintain fitness and function. Reversal of changes within the tendon are possible at this stage. With a stage 3 degenerative tendinopathy, the matrix and cell changes are progressed to a level that no reversal is possible, so treatment and management is aimed at the long term, consisting of eccentric loading, strengthening and stability exercises. A degenerative tendon is usually seen in the older athlete and occasionally in the younger depending on the extend of the chronic overloading. There may be areas of thickening and acute bouts of pain may indicate areas of stage 1 tendinopathy within the tendon. With a heavily degenerative tendon, there is also the risk of rupture. Treatment therefore needs to reflect the symptoms; as per stage 1 until the acute pain settles, then a long term programme of exercises as mentioned above. Malliarus et al however suggest that there is little evidence for isolating the eccentric component in tendinopathy rehabilitation of the achilles and patellar tendon, instead that a programme of eccentric, concentric and isometric had the best outcomes. There is no one way to treat the tendinopathy, so working with a physiotherapist to manage the symptoms is advised as is how to use rest  along with a graded return to activity. Once any symptoms have resolved, a graded return to normal stretching activities can also begin. Stretching should never be painful activity however. sit in a position as below. Sit as tall as possible, avoid slumping through the lower back. Stand and open the legs to a wide stance. An example of an isometric exercise: sit on a chair with the resistance band above the knee and hold the leg in an adducted position, against the resistance of the band. Holed for as long as is comfortable. Resistance can be adjusted by putting more or less stretch on the band. An example exercise, to strengthen the adductors: Stand near a table with a resistance band around the ankle of the affected leg. Stand on a block with the unaffected leg so that the affected leg can swing freely. Keeping the back and knee straight, slowly take the leg away from the midline. Then adduct the leg. Understanding the stage of the tendinopathy is key to effective treatment and the long term management of symptoms. There is the chance of symptom reversal in the early stages, but a degenerative tendon requires a programme of long term management to avoid rupture or the need to completely stop activity. There is no single approach to the treatment and management of tendinopathy with individuals varying in their response. Medical management may be used where exercise treatment is having no effect, for the immediate relief of pain, but caution has to be used with the use of steroids. ↑ Ebonie Rio; Dawson Kidgell; G Lorimer Moseley; Jamie Gaida; Sean Docking; Craig Purdam; Jill Cook, Changing the Way we Think About Tendon Rehabilitation A Narrative Review Br J Sports Med. 2016;50(4):209-215. ↑ 6.0 6.1 Cook JL1, Purdam CRIs tendon pathology a continuum? A pathology model to explain the clinical presentation of load-induced tendinopathy. Br J Sports Med. 2009 Jun;43(6):409-16. ↑ Nehrer S, Breitenseher M, Brodner W, et al. Clinical and sonographic evaluation of the risk of rupture in the Achilles tendon. Arch Orthop Trauma Surg 1997;116:14–18. ↑ Malliaras, P., Barton, C.J., Reeves, N.D. et al. Achilles and Patellar Tendinopathy Loading Programmes, Sports Med (2013) 43: 267. ↑ 12.0 12.1 Morelli V, Smith V.,Groin injuries in athletes.,Am Fam Physician. 2001 Oct 15;64(8):1405-14.